Guidelines | Institute of Hotel Management, Catering Technology & Applied Nutrition. All candidates admitted to different courses will be required to put in a minimum of 75% attendance during the academic session. Students failing to secure 75% attendance shall be debarred from appearing in the annual examinations to be conducted by the National Council. Principal of the institute is empowered to condone up to 10% of absence on medical grounds. Such requests should, however, be accompanied by medical certificate issued by any registered medical practitioner. Candidates admitted to the Diploma Programs are required to appear in the in-house mid term examination to be conducted by the Institute in December ’08 / January ’09. 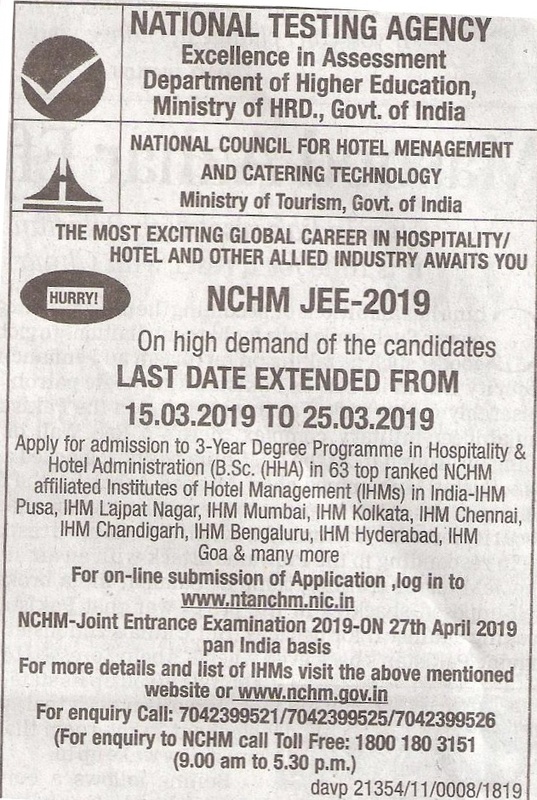 Annual examinations of all the courses are held on All India basis by the National Council for Hotel Management during the May every year. Students are required to maintain strict discipline in the campus. Smoking is prohibited. Consumption of alcohol or drugs during the course of study is an offence. Conduct of the students in their classes as well as in the premises of the institute shall be such as will not cause any disturbance to the fellow students or to other classes. Principal may expel a student whose work or conduct is not satisfactory and the fee paid will be forfeited. Students must not loiter about the institute premises while the classes are on. Students shall do nothing inside/outside of the institute that may in any way interfere the administration, discipline and studies. No student will be allowed to take part in current politics. No student should communicate any information or write about matter dealing with the institute administration to the press. Students are expected to take proper care of the institute’s property and to help in keeping the premises neat and tidy. Any damage done to property of the institute by disfiguring wall, rooms, fittings or breaking furniture etc. is breach of discipline and are liable to punishment and recover of loss. If for any reason the continuance of a student in the institute is in the opinion of the Principal, which shall be final, detrimental to the best interest of the institute, the Principal may ask such student to leave the institute without giving reason for his decision. Absence without leave is considered a breach of discipline, leave without permission is liable for fines. No leave will be granted without previous application expect in case of illness or emergency. Prior permission must be obtained for all other leave from Principal who will consider the application of individual merits. Name of the student, continuously absenting himself for more than 2 weeks (ten working days) without permission, shall be struck off from the institute rolls. Student can be re-admitted on payment of Rs.100 within five working days in case Principal is satisfied that an absence was due to circumstances beyond the control of the student. Any property of the institute damaged due to negligence of student, cost will be recovered from him. This will be in addition to any other disciplinary action as may be considered appropriate by the Principal. Non-compliance of the rules of the institute can also be dealt with by means of suitable fines and disciplinary action. Candidates are not allowed any part time job, or any other course of education along with the training. Defaulter shall be terminated with the sole discretion of the Principal. Institute cannot accept any liability in respect of any accident a student may sustain while engaged in practical work due to any reason. Students should instruct their friends / relatives not to call them on the office telephone. The students are also prohibited to use the office telephone. Parents / guardians are required to obtain progress report of their ward in the first week of every month, on any working day. There is a prescribed uniform code for attending theory and practical classes that is required to be followed by the students of Bsc. Program and Diploma Programs. As per the curriculum, the students of all the disciplines are required to undergo Industrial Training for the period of six months.